/ Norway / Norway in a Nutshell Review – Is It Worth It? 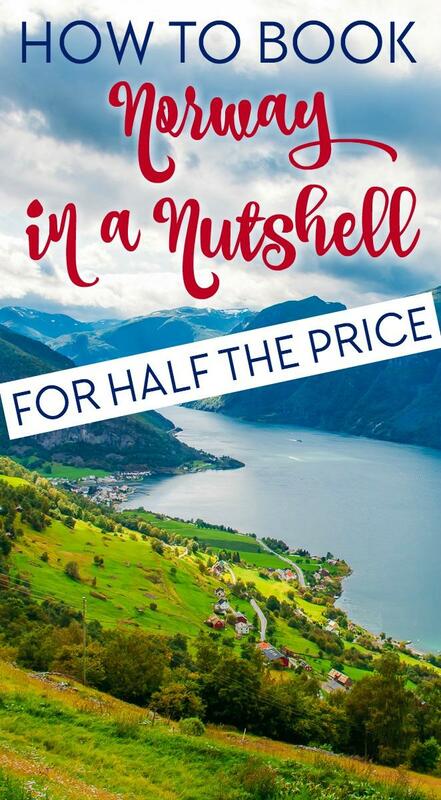 Norway in a Nutshell Review – Is It Worth It? I can tell summer is just around the corner now, because more and more people are asking me about Norway’s most famous tour: Norway in a Nutshell. 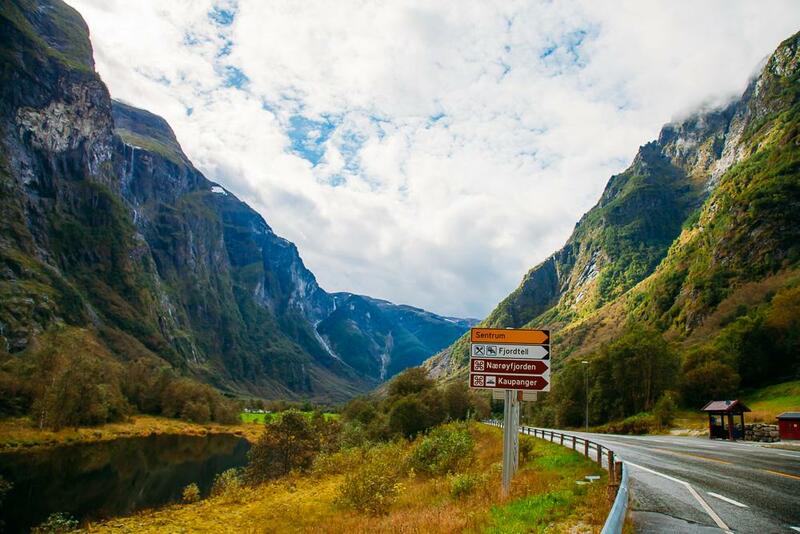 There are a few different versions of this tour, depending on whether you’ll be departing from Oslo, Bergen, Voss, or Flåm, but they all have the same objective: to take you through the beautiful scenery of the Flåm Railway, Aurlandsfjord, Nærøyfjord, and Stalheimskleiva. 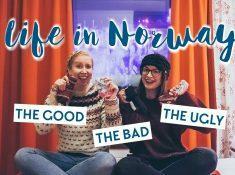 So for everyone who has asked for my personal Norway in a Nutshell tour review here it goes: I don’t think it’s worth it. Okay, maybe it’s a bit more complicated than that. I just have two problems with the Norway in a Nutshell tour: 1. it uses public transportation and 2. you’d be able to see more for less money if you rented a car. The first point is actually my biggest issue with the tour – Norway in a Nutshell isn’t a guided tour, it just provides you with a set of tickets, all of which you could book independently for much cheaper. So you’re essentially paying a (pretty high!) fee to have someone book tickets that you could easily book online yourself. Like, I feel like Norway in a Nutshell is almost a bit of a scam! I mean, I guess the convenience of having the tickets booked all together in one place is worth it for some (especially as a few legs of the journey can’t actually be booked in advance otherwise – though they also don’t need to be), but it seems a little crazy to me that this is sold as an expensive tour when all you’re actually getting is a bunch of public transport tickets. But the dumbest part is that if you’re booking through the tour, you’re going to be traveling on all of the busiest buses, ferries, and trains, with everyone else who has booked the same tour. Whereas if you did the same route independently you could choose transport times to avoid all the crowds. So if you’re not able to rent a car in Norway, I recommend doing a DIY version of the Norway in a Nutshell tour by booking the same itinerary yourself. You’ll save money (especially if you book your trains well in advance!) and have more flexibility to avoid the busy travel times and maybe take the journey a little more slowly, if you have time. It’s actually incredibly easy to replicate the Norway in a Nutshell tour because they give you all their itineraries on their website. So if you want to do the exact Norway in a Nutshell tour you can simply find the itinerary you want to copy here, and then book your train, ferry, and bus tickets yourself. So for example, if you want to do a tour starting in Oslo you can use this itinerary. Note: this tour gets incredibly crowded in the summer, especially in July, so I would highly recommend visiting outside of that time if at all possible. 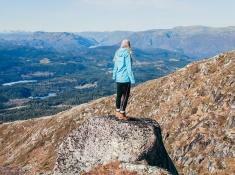 Another advantage of booking Norway in a Nutshell independently is that you can supplement it with some other really cool tours and activities since you’ll be deciding all of your own transport times. You’ll find some really great adventure tours and activities here (like zip-lining and even taking a helicopter ride over the fjords!). And since you’ll be saving money by booking Norway in a Nutshell yourself, you’ll have extra money for adding activities. You can book the train on the NSB website. If you book well in advance (you can book them up to three months in advance) you can get a really good deal on a “lowest price” ticket for the longer stretches – I’ve booked 10 hour train rides for 249 NOK (less than $30). There are some regional trains, like the one to/from Bergen from/to Voss, that you can’t actually book in advance. But don’t worry, these trains don’t have assigned seats so you just need to arrive at the train station in good time to buy your ticket and you’ll be fine (worst case, if you board the train late you might have to stand if it’s very full). Now, the one annoying thing about booking the NSB trains yourself is that the website won’t process credit cards from the United States, Canada and Australia, because apparently they lack a security protocol used for safe payments in Europe. Instead you can pay online with PayPal, or if you don’t have PayPal (though really, you should have PayPal) you’ll have to call NSB at +47 23 62 00 00. They speak perfect English, so you can just tell them which routes you want to book and then they’ll send you a link to pay with your card. It sounds like a pain, but it should actually be really easy! 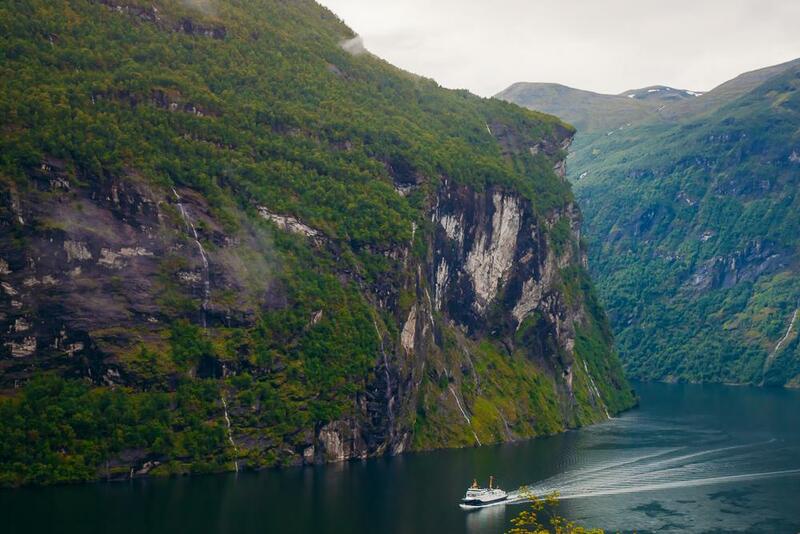 You can then book your fjord cruise here on VistFlåm, and again you can either follow the Norway in a Nutshell itinerary and book the same Nærøyfjord cruise, or choose a different ferry or time (if you go early or late you can avoid some of the crowds). Be aware that these cruises do book up, so you’ll definitely want to book this one in advance! Personally here I’d choose the 17:00 ferry, which should be much quieter, and then I’d spend the night near Gudvangen (which is gorgeous). And when you’re in Gudvangen you could also stop by the Viking Village. This isn’t a museum, but a village where people live like Vikings. 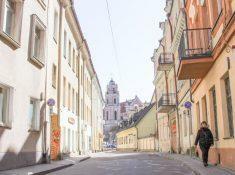 There are regular guided tours from June to September, and you can talk to the locals who have chosen to live like this even today. It’s a really interesting way to learn more about the Viking era, from people who are so incredibly passionate about it that they continue to carry out the traditions and way of life. While you do want to book long bus journeys in advance, as tickets online are cheaper than buying on the bus (I actually tend to just book them on my phone right before boarding the bus), depending on your route you’ll probably just be using the local bus on this journey, where you’ll by your ticket from the driver. Again, just get to the bus stop in time and you’ll be fine. You can check the local bus schedule for the buses around Hordaland on Skyss. So for example, from Gudvangen (Gudvangen kai) to Voss (Voss Stasjon) you’ll simply put in the two stations and see the timetable – you can then choose to get the same bus that’s listed on the Norway in a Nutshell itinerary, or you could get an earlier or later one, depending on what you want to do. The Voss – Gudvangen kai bus costs 100 NOK and you should have exact change for the driver. One thing to note: only the bus departing to/from Gudvangen kai (the dock where the ferry leaves from) from/to Voss will do the hairpin route via Stalheimskleiva. There are also some express buses to/from Gudvangen E16, but they go through a tunnel instead, and the bus stop is about 500 meters from the ferry dock. And then from Voss you’ll probably be getting the train back to Oslo or Bergen, which you can again book on the NSB website. If you were going straight back to Oslo you could get the evening train so that you can see the scenery (luckily at this time of year it will stay light! ), or you could get the overnight train. Personally I would get the evening train, as there are many hotels right near the train station in Oslo, so it won’t be a problem getting in late. So the total cost for roundtrip from Oslo via Voss (I included an overnight by Gudvangen here, so the hotel would be extra) would be 1318 NOK (about 158 USD). If you booked the same tour with Norway in a Nutshell it would cost 2480 NOK – that’s a 1162 NOK difference, or about 140 USD! So the tour can be nearly half the price if you book it yourself. That’s kind of absurd, no? Usually I’m a huge fan of public transport, especially trains, but in Norway I always always prefer to travel by car. First because renting a car in Norway is usually cheaper than using public transport (at least if you’re two or more people), and second because having a car gives you the freedom to explore more of the countryside. The Flåm Railway is one of the most beautiful rail journeys I’ve ever done, but I also found it to be an incredibly frustrating experience because I wanted to be able to stop in the prettiest areas and explore off the track a bit. And unlike some train journeys I’ve taken in the past, the Flåm Railway doesn’t actually go anywhere special that you couldn’t go with car, so you actually will be able to see more if you drive instead. Plus then you can get farther off the beaten path, which is especially helpful in the summer when the Norway in a Nutshell tour route is so, SO crowded. Norway is also one of the easiest countries I’ve driven in. Yes, the roads have lots of twists and turns, but they’re generally quite wide (at least compared to some other places I’ve driven!) and with very little traffic. The only time I don’t like driving in Norway is in the winter when there’s lots of snow on the roads. So yes, if you are at all able to rent a car in Norway I would 100% recommend taking a road trip around the fjords instead of doing the Norway in a Nutshell tour. You can find my favorite road trip route from Bergen here, or you could follow the Norway in a Nutshell route more closely. I’ve also written up a post with my top picks for places to stay along Sognefjord (including some lovely off the beaten path villages). If you’re on a really tight schedule you might not be able to stray too far off the main route, but I highly, highly recommend taking a look at my list and seeing if you can stay at at least one of these places, because they are so much nicer than the main tourist spots. 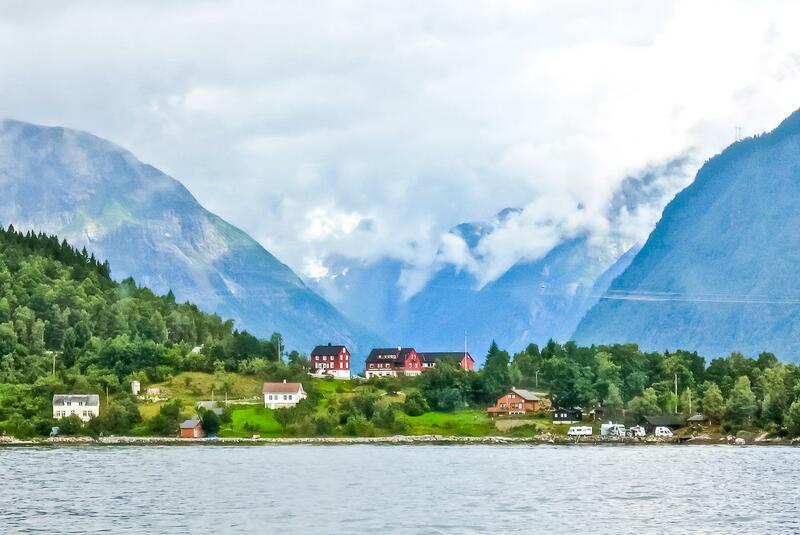 And then of course if you want to see the fjords from the water you can book a fjord cruise. Again, I recommend doing a cruise early or late in the day, as midday can get really crowded with tour groups. Thank you so much for the information, i am intending to visit Norway and Tromso for the 1st 2 week of December 2019. Do you have any recommendation or guide that i can follow? Northern Lights is definitely a must visit in our itinerary. We are planning for May, but the gas price is little confusing. One of my friends told me that it would be so expensive if we travel hy car. Can anyone please kindly guestimate the car travel cost from Oslo to Bergen based on the current gas price in Norway? The price and metric comparison giving me hectic in comparison to USA gas price calculator. Gas costs about 16 NOK per liter right now, so you need to look up the gas mileage of the type of car you’re looking to rent and then divide the number of miles you’ll drive by the gas mileage (in liters), and multiply that by 16 to find out about how much you’ll spend on gas. 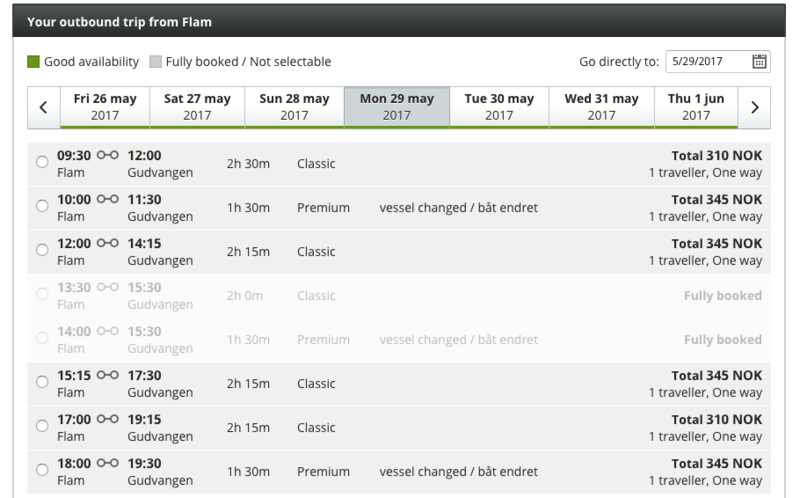 I just priced this out for a day trip from Bergen as a loop back to Bergen for a Friday in June. 4625NOK on the NIN website; 3594NOK booking separately for 2 adults and a child; saves about $115 USD. Hi, Silvia. Thank you for all of the great information. My wife and I are planning a trip to Norway mid-September of 2019, three weeks through the first week in October. We will do nine days on Hurtigruten (Bergen to Kirkenes to Svolvaer) then a week driving around Lofoten and maybe Senja, too. Two questions: Considering what we are doing, would NIN be overkill or more of the same? Second, what do you think about Northern Norway and Lofoten from mid September to early October? First of all, thank you soooo much for this post! It’s so detailed and with all the links, it’s just fantastic and a precious help to all of us. 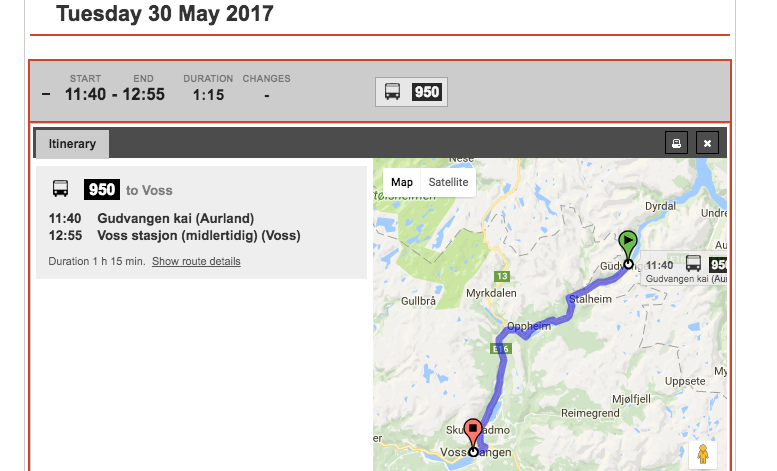 I’m planning to do the NiN in May, but I’m thinking about the “reverse” route (beggining in Myrdal and ending in Voss). But, due to train and buses schedules, I need to spend around 2h both in Gudvangen and Voss. Do you think I can entertain myself for a couple of hours there, or I’m gonna be bored? I don’t mind walking a bit, or spending some time just reading and enjoying a warm drink – I even think it might be a way to know some cute places – , but I’m afraid that the places would be too quiet and with nothing to see/do in a walkable distance to the station (it was the problem with ending in Myrdal, because I nedded to spend 1h there, and I read it is mainly a transit station, so I decided to try the oposite route – just not sure if it’s a better option). Thank you very much in advance! Happy 2019! Hello Silvia! I am LOVING your blog. Thank you SO MUCH for the work you put into it. The links to all things you suggest are so helpful. You seem to think of EVERYTHING and I love all your pictures. I feel like I like to travel in a similar way to you. 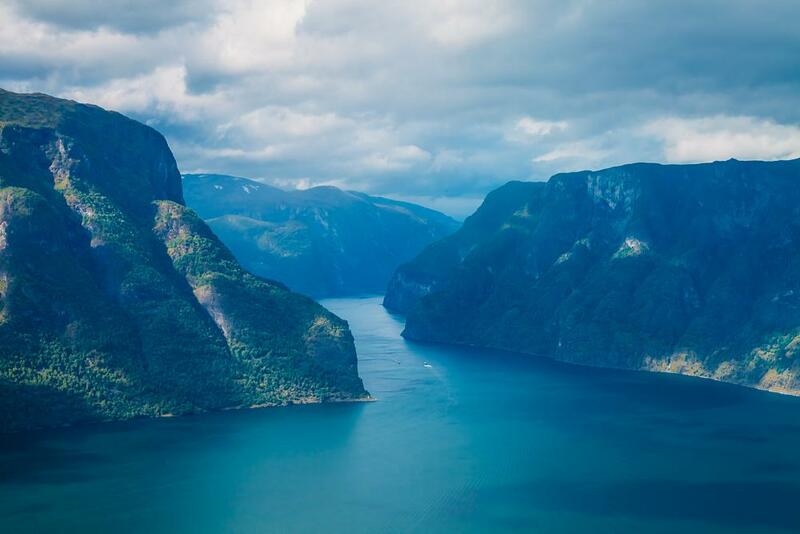 With that, I have been dreaming of traveling to Norway and have just purchased my flights for October 2-22, 2019. I am traveling with my mom… she is 71. So I won’t be doing any camping but still want to hike & kayak (per what the season allows :)). 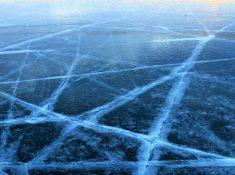 I have been looking into the Hurigruten round trip cruise. I was overwhelemd by ALL of the options in the Country and had heard that a cruise was a good way to see a lot on a budget (?? really?). But not knowing any better I found Hurtigruten and for a cruise, it looked great. But After reading many of your posts and this one especially I wondered if you had any thoughts on the cruise. Right now OUr plan is to do the round trip cruise (Bergen to Kirkenes and back to Bergen) and then travel for 5 days after… Probaby to Oslo and maybe back to Lofoten (Rein) or to that town you talked about, Ana-Sira Or Stavanger. So much is in the works :). Just wanted to get your thoughts… Cruise or no? 🙂 Thank you! Hey, thank you for all the detailed tips. I am planning to visit in 1st week of November, not sure if its a bad idea? I imagine it will be too cold and days going to be short too, so we have to do one thing in a day and cant keep train journeys or cruise for evenings as will be dark to see anything? I have no compelling reason as such to visit in November only but me and my friend both wanted to visit norway and we have weekend free that time.Flights are cheap too but then we dont want to come if we cant explore and enjoy the beauty around.